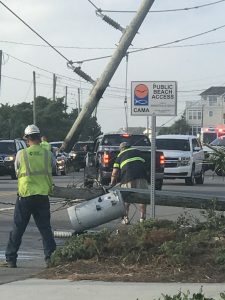 A car crash on Saturday, June 23 knocked out power to part of Wrightsville Beach. 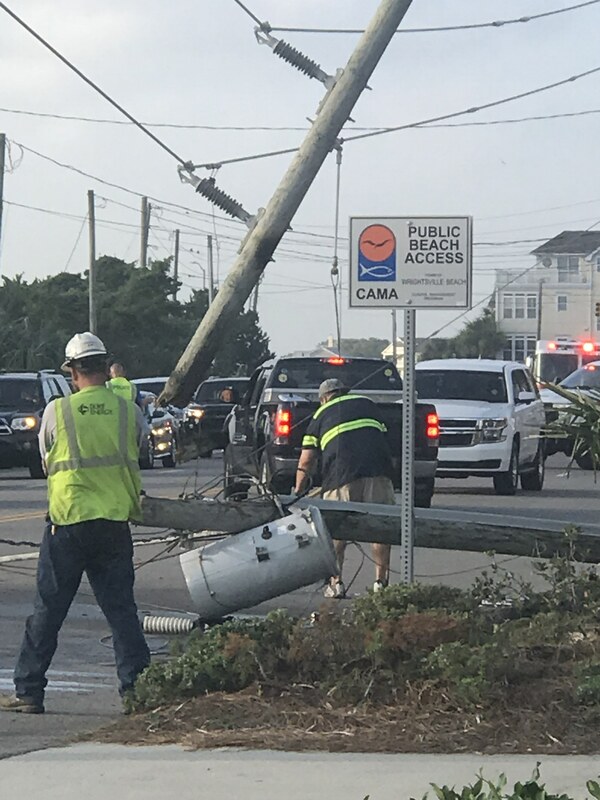 When the electricity went out in several areas of Wrightsville Beach on Saturday afternoon following a car wreck, several business owners found themselves in an unexpected costly predicament. 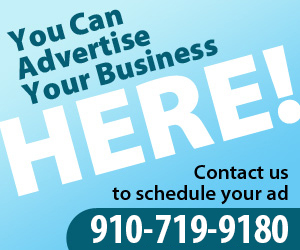 With no power and, therefore, no electronic credit processing system or refrigeration, several restaurants were forced to close their doors, unexpectedly missing the lucrative Saturday night revenue. However, one hotel’s generator made it the spot to be on the south end, welcoming locals looking for a reprieve from the heat. South Beach Grill owner John Andrews, who was forced to shut down the restaurant just as the busy Saturday night crowd was filing in, said he was talking with other merchants to see how they could get compensated for their loses. Andrews said the burden of the power outage, which lasted from about 4:30 p.m. to nearly midnight, wouldn’t just be felt by him, but also by the staff. After losing power for three hours, Banks Channel tried to reopen, only to have another outage with a full restaurant and bar on Saturday evening, interrupting operations enough to force the owners to close again. The outage put Banks Channels in the difficult position of whether to close, not only losing business, but potentially aggravating customers. Restaurant owners said the situation was in some ways worse than storms and weather-related disruptions to tourism, since that can usually be forecast, with adjustments to staffing and inventory. The unexpected outage hit right as the restaurants were fully staffed, with full inventories. “The timing could not have been worse,” Andrews said. However, while other local businesses thirst for electricity, the recently-added 625 kilowatt, diesel powered generator at the Blockade Runner helped fuel a record Saturday night for the hotel’s East restaurant. Owner Bill Baggett added the generator to the hotel last year after several years of planning. He said the five-day outage that occurred after 1996’s Hurricane Fran demonstrated the need for the generator. Switching on 15 seconds after the outage first occurred, the generator kept the hotel’s air conditioners running, which Baggett said was crucial to battle humidity and prevent mold in the rooms. But on Saturday, the generator also fueled a record crowd at the hotel, with many neighbors coming in for relief from the heat. With the success of the generator, Baggett said he hopes it shows town officials that the Blockade Runner could be a potential site for town staff in the event of a hurricane evacuation. Hurricane plans usually include staff staying at a nearby hotel off the island. And while the outage caused big problems for several business owners, some reported big support from the community as well. Andrews said that restaurant owner Jim Radle, whose 22 North did not lose power, offered to store food in his restaurants refrigerator. “When one business here is affected, everyone reaches out,” Andrews said. That support was also seen on social media, as locals came in droves to South Beach Grill to show their support on Sunday.